Substitute Harvey Jones, who scored Clipstone's late consolation goal. Fuming assistant manager Steve Smith branded Clipstone’s display as “the worst performance I have witnessed over the past two seasons” as they plunged to an 8-1 defeat. The Cobras crashed at home to Derby outfit, Graham Street Prims, to leave them third from bottom in the Premier Division of the East Midlands Counties League and still needing a point to stave off relegation. Smith blasted: “Although we were missing a number of key players through injury and suspension, the manner in which we rolled over was painful to watch. “A lack of character, desire and commitment, along with some awful individual errors, sealed our fate. 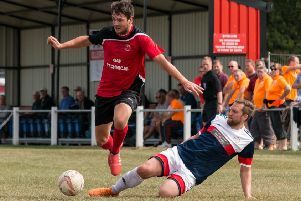 Clipstone have three games remaining, including against local-derby rivals Rainworth on Easter Monday, to avoid being caught by Borrowash Victoria, who are next to bottom and need to win all their last three matches. They actually made a bright start against Prims, but things went downhill from the 24th minute when Joe Hunt opened the scoring by pouncing on a loose ball. Four minutes later, Brad Scard doubled the visitors’ lead from the penalty spot, and by half-time, it was 4-0 as Michael Fizhugh grabbed a brace to put the game beyond the Cobras’ reach. Seven minutes into the second half, Stephen Byrne netted a fifth for Prims before Scard was allowed too much time in the box to bag his second goal of the game. 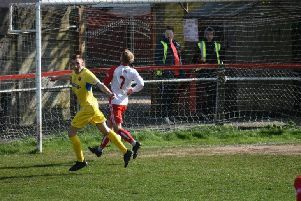 On 82 minutes, Matthew Harris made it 7-0 and although substitute Harvey Jones netted a consolation for Clipstone with a well-taken free-kick, the respite was shortlived as Dominic Wilkinson got his name on the scoresheet with the visitors’ eighth to complete the rout. CLIPSTONE LINE-UP -- Dando/ Paling, James, Gregory (Jones 56), Gregory J. (Spencer 56), Short, Bullock (Booth 56), Nowaczyk, Ashton, McDonald, Limb, Robinson. Subs not used: Smith, Munson.